Gastric (Lap) Band – Part 1; What is it? Part of understanding my journey is knowing that I had a Gastric (Lap) Band surgically implanted around 4 years ago. I realized that I haven’t written a lot about the Band, why I had it, what is does, and why I chose that path. This first post (in this series) will look at what the lap band is, and how it works. I get a many questions about this and hopefully this post will be able to clarify some of the more popular queries. 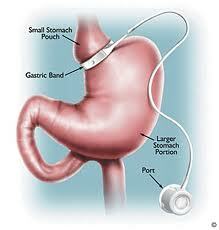 A Gastric Band is a device that is placed around the top of your stomach. Looking at the picture to the right we can see that there is a plastic ring which on the inside has a silicone tube, this section is adjustable via saline solution being filled into the port. The inner sections are adjustable with saline solution via the port and when filled contracts more around the opening of the stomach section is adjustable. From the band a tube runs down to a port, this is how the saline solution is injected into your band, essentially filling the silicone up and tightening it around the top of the stomach. The lap band is inserted into you body via keyhole surgery. The surgeon places the band around the top section of your stomach, where the stomach meets the esophagus. When adjusted the band creates a small opening into the stomach. It causes the brain to believe that you feel full, with a very small amount of food or sometimes even when you don’t eat. The band stimulates the nerves that sends these messages to the brain. The band also physically creates a small pouch like stomach above your stomach. The food that you must chew well slowly enters the stomach. This makes you feel full and you don’t consume as many calories. The port of the lap band is stitched to the muscle wall of the abdomen under the skin. After surgery your doctor / surgeon adjusts it with using a needle to inject saline which travels up tubing into the band tightening it. The adjustment is a simple procedure, seeing a doctor at their rooms like a normal consultation, I am usually in and out in 5 – 10 mins after a quick weigh in and chat about my progress. The lap band can stay implanted indefinitely as long as are no issues. 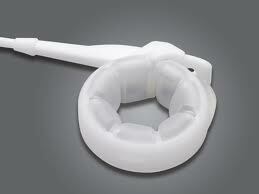 As it is adjustable all the fluid can be removed and you will have no restriction if required. The Gastric Band is not an easy solution, you can cheat the band, eat all the chocolate, ice-cream, mushy food and anything liquid you like, they slide right on through and the calories on these add up quick. The band does have some issues however, sometimes I can’t keep food down, I can have days where I feel a bit more restriction than others and the band feels tighter and when happens food gets “stuck” and won’t go through the band – it can be painful and results in food coming up (not quite vomiting more like a painful swallow back up). The Band is an aid in weight loss, it doesn’t do the work for you, I have worked hard to watch my portions, my food choices, and then there is exercise – a lot of exercise. For me the band was the tool I needed to get off the bulk of the weight to allow myself to begin to have success reprogramming my former failure mentality and be able to engage in physical activity. This entry was posted in Surgery, Weight Loss and tagged adjustment, banding, brain, cheat, device, Food, gastric, gastric sleeving, Health, issues, lap band, restriction, rouxen y, saline, scales, surgery, Weight Loss, work by linkeech. Bookmark the permalink.